HanDBase, by default, takes the fields you've defined and creates a data entry screen automatically. In many cases this suits the bill just fine- you see a list of fields with the field name to the left or above the place to enter the value, and the screen can scroll vertically to accommodate for larger amounts of fields. Often times customers want to have full control over the data entry screen. Perhaps rather than a list of fields, you'd like to walk the user through a questionnaire or wizard style of your questions. Or perhaps you don't want a big list of fields, but would rather divide your database table into separately grouped tabs. 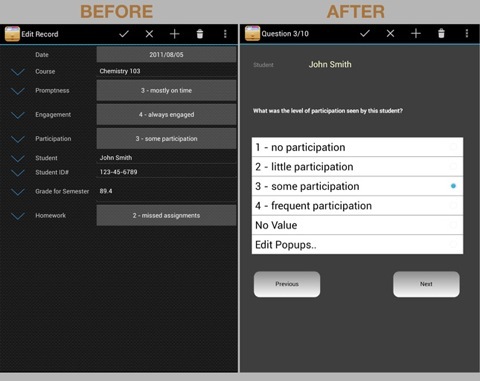 The HanDBase Forms designer for Android is a drag and drop tool to create these forms. By adding controls such as Text Boxes, Labels, Buttons, Popups, Tabs, etc to the canvas you create the interface exactly as you'd like it. Add pictures to forms to show a logo or create an entirely graphical interface for your design. It's like giving your database an extreme makeover!! Will the Forms I create on other versions of HanDBase work on my Android phone or tablet? Yes! The forms you designed in other platforms will work on Android as long as they were designed in HanDBase 4.0 or higher on that platform. In some cases some tweaking or modifications will be necessary to account for screen size, but most of the time they will work just like they did on the Palm OS, Windows Mobile, iOS, Windows desktop, etc versions. Do I need to purchase HanDBase Forms to take advantage of this? Yes and No. To use forms that have already been designed, you don't need to purchase HanDBase forms- just install the forms file to HanDBase using Desktop Connect mode and they should run just fine. To actually create and design the forms you do need to purchase a forms designer. There is one available for the Windows Desktop and one available for the Android. You may be surprised to find that designing on Android is actually easier than on the desktop as you are seeing a true representation of exactly how it looks on screen. 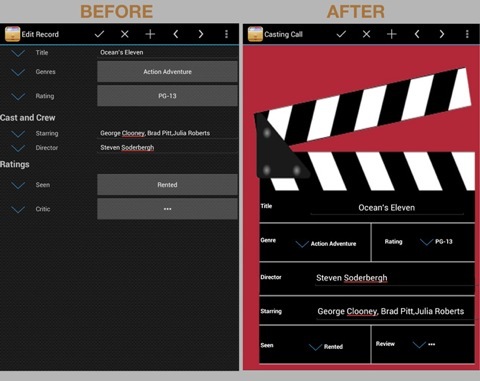 Plus, we've made great efforts to make the interface easy to use with a finger and the small screen! How do I purchase the HanDBase Forms for Android Add-on? 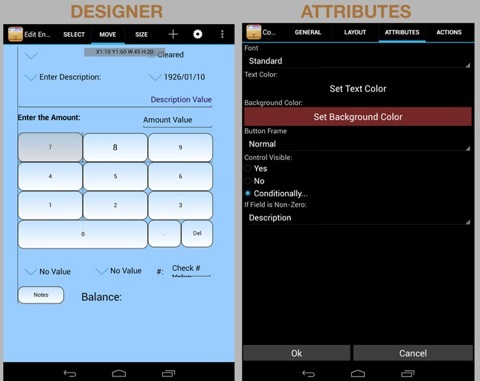 We are using in-app purchase to enable the forms designer within HanDBase for Android. So the process is simple- in any database, go to the database properties. You'll see a section for Forms. Tap this section and a buy button will appear. Purchase this via your Google Play account and the feature is immediately unlocked for your use. The cost for this add-on is only USD $4.99. You can also purchase the Desktop Forms designer if you're using a Windows computer. It's bundled in the HanDBase Professional for Android add-on and the HanDBase Enterprise for Android add-on. These can be purchased here.